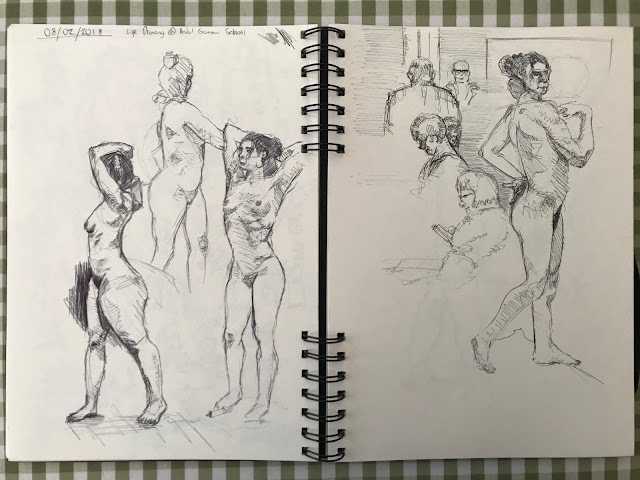 James Broderick Design Blog: Life Drawing Art Dump! Week 2 - Biro doodles. This is little art dump containing all the sketches I did in week 2 of my life drawing classes at the Bristol Figure Drawing Group. In this session I wanted to get into some serious practise, to hone my skills. One thing I think is lacking in my work is confidence in my lines, I notice I tend to chicken step a lot which can lead to broken up drawings. I also want to improve the overall accuracy of my drawings. This means getting the anatomy and general form correct, which is in turn done by looking and observing the model more, and checking the spacial relationships between different parts of the body to make sure everything is in the right place. I stuck to a very simple medium for the whole session, just so I can focus on the one skill of improving my line quality. It was actually rather nice using the biro, I normally hate using them but I actually had a lot of fun using it. It feels like I could get the 'sketchiness' that one might bet if they use a pencil, but with that added permanent effect which forces me to try and not make mistakes! Also, in other news, I'm getting a new pair of glasses Monday to flourish everywhere, which means NO MORE DAMN HEADACHES! Seriously, any and all screens have been giving my massive headaches ever since I have stopped wearing my glasses. So yeah, I'm happy to get another pair, it has been causing me a lot of pain over the last two weeks with all the student marking I am doing. White excel documents are my Kryptonite at the moment.